Home > Economics help blog > economics > What happens when quantitative easing ends and is reversed? What happens when quantitative easing ends and is reversed? Central Bank creating money electronically. Using this extra money to purchase government bonds (and other securities) from banks and financial institutions. Increase bank liquidity. When commercial banks sell bonds to the Central Bank, they have an increase in their cash reserves. This increase in cash deposits should, in theory, encourage commercial banks to lend to businesses. Reduce interest rates. Through buying government bonds, the market price of bonds rises, leading to a reduction in long-term interest rates. Lower interest rates should, in theory, encourage greater economic activity in the economy. What happens when quantitative easing ends? A fall in the price of bonds, due to increased supply on the market. As bond prices fall, the bond yield will increase. Therefore, we will see rising interest rates. A decrease in cash reserves in banks. If banks buy government bonds, they will have a fall in their cash reserves; this could lead to a fall in the money supply, lower growth and possibly even deflation. So will we get inflation or deflation when quantitative easing ends? If the Central Bank extends too much extra money and allows this extra money to stay in the economy during a strong recovery, then it is likely to contribute to inflation. If the Central Bank reverse quantitative easing too early – if they reverse quantitative easing when the economy is still in a liquidity trap / stagnant growth, then it could cause the economy to stagnate further. If quantitative easing is reversed when the economy is still weak, we could see deflationary pressures. Therefore, the timing of quantitative easing becomes important. The hope is that the process of quantitative easing can be gradually reversed during a sustained economic recovery. Obviously, the Bank will not want 10-year. But, if it can sell £20bn every couple of months, the policy may be reversed without causing too much impact on the macroeconomy. If the economy is growing strongly, then the reduction in money supply and higher interest rates from Q.E, will be absorbed. The other reason why it is hard to know what happens when quantitative easing ends is that it’s hard to know if quantitative easing has had much impact on stimulating the economy in the first place. 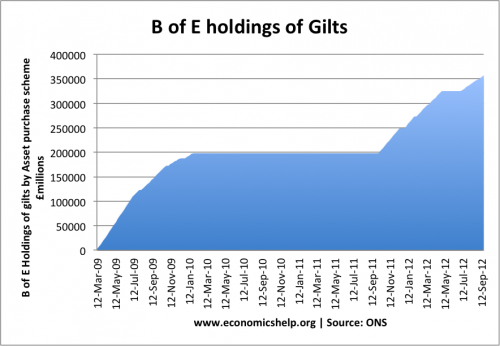 In the past few years, the Bank of England has increased its holding of government bonds (gilts) to over £350billion. 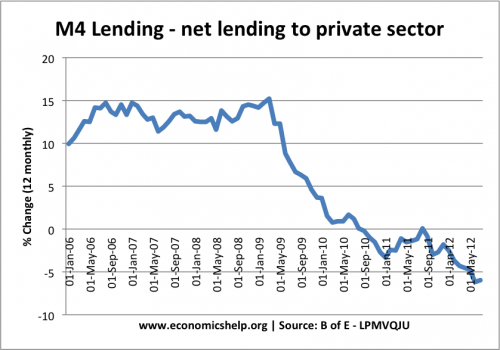 Yet, the impact on M4 lending has been limited. 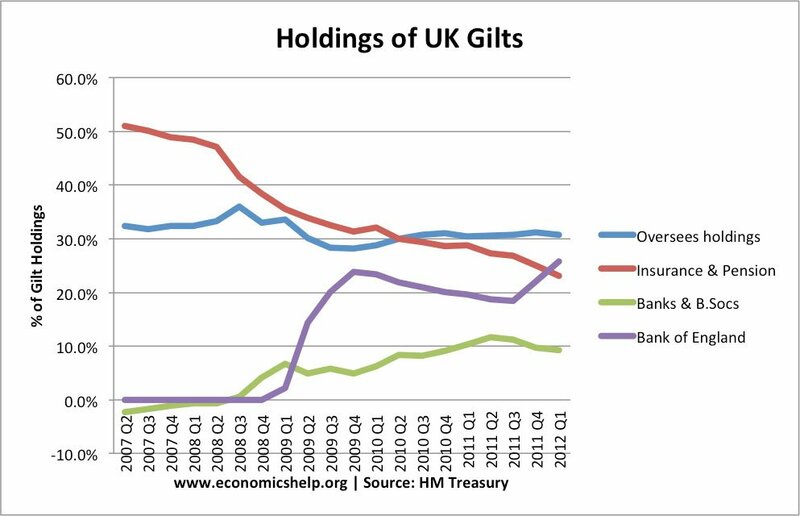 In 2012, we saw negative growth in M4 lending, despite the £350bn of extra securities. It is reasonable to surmise that the recession would have been deeper without this monetary stimulus of Q.E. How will government borrowing be affected by the end of quantitative easing? And despite record budget deficits, bond yields have fallen to record levels. When quantitative easing ends, there will be no Central Bank to buy bonds. When quantitative easing is reversed, bonds will be sold onto the market. 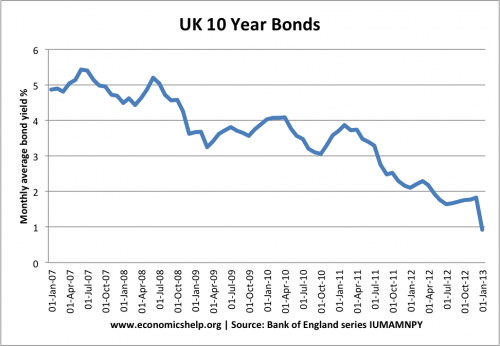 Some fear that this selling might cause the ‘bond bubble’ to burst. Bond prices will fall, and interest rates rise. This could make it very expensive for the government to finance it’s borrowing. Higher rates could derail the recovery. With very low-interest rates, the annual debt interest payments are around £45bn, if interest rates rise significantly, this cost of interest payments will rise significantly. This will be an unwelcome consequence of reversing quantitative easing. Quantitative easing should only be reversed when the economy is growing strongly. When the economy is growing strongly, the government will see its debt burden fall. However, when the economy recovers and the Central Bank reverses Q.E. interest rates will definitely rise. When Q.E. ends, we will see higher interest rates. But, hopefully, the end of Q.E means the economy is returning more to ‘normal’ levels of economic activity – growth of 2.5%, interest rates will rise back to more ‘normal’ levels. If nothing else, this return to ‘normality’ would be very welcome. However, there is no sign of this occurring in the foreseeable future. It is hard to know exactly what will happen because there are few precedents for ending such a policy of quantitative easing. This entry was posted in economics and tagged quantitative easing. Bookmark the permalink.